In the world of comedy, two countries stand tall above all others. Or at least that’s how writer-performer Ricky Gervais sees it. “The big two,” he says. “Britain and America. Sorry, rest of the world.” Oversimplification or not, it’s easy to see how Gervais came to that conclusion. These two nations have dominated both film and TV comedy for decades. But what, specifically, separates British humor from American humor? The web series Now You See It tackles this issue in a video essay called “British Vs. American Comedy: What’s The Difference?” Though the essay is hesitant to make any easy diagnoses, one persistent theme is that Americans possess a level of optimism that their British counterparts simply lack. The U.K. and U.S. versions of Gervais’ best-known creation, The Office, are used to illustrate this point. 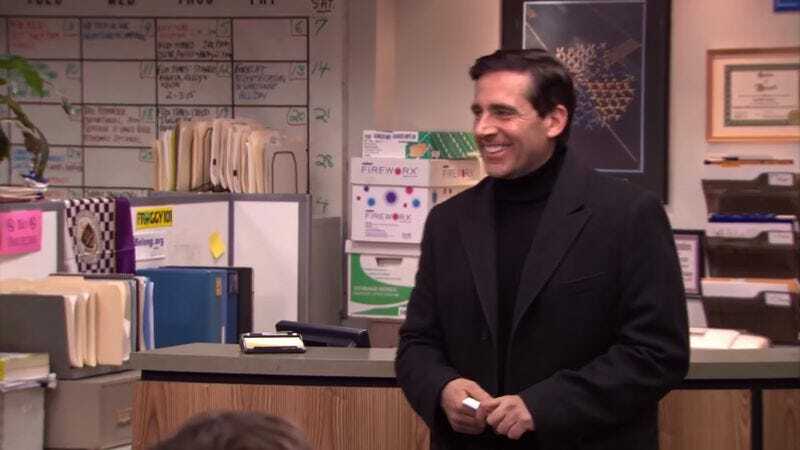 Both David Brent (Gervais) and Michael Scott (Steve Carrell) are oblivious, blundering fools, but Michael’s antics inspire sympathy in those around him, while Brent’s blunders are merely a source of embarrassment and unease. It’s telling that Michael gets to exit his series on a grace note, leaving his job by choice, while David is shown groveling for his meager position. Why? Gervais says it’s because Americans grow up thinking they can be president someday. But maybe England is winning the war, so to speak. The video has numerous examples of how British pessimism might be creeping into American comedy as well. The protagonists of both Louie and Curb Your Enthusiasm, for instance, often end their episodes in complete humiliation and defeat. And It’s Always Sunny In Philadelphia might be a scathing critique of American optimism. Its characters have way, way too much confidence in themselves, often leading to nasty consequences for everyone in their path. Meanwhile, the eternally droll Stephen Fry has a great example of the fundamental difference between British and American attitudes toward humor. You know that scene in Animal House where there’s a fellow playing folk music on the guitar, and John Belushi picks up the guitar and destroys it. And the cinema loves it. [Belushi] just smashes it and then waggles his eyebrows at the camera. Everyone thinks, “God, is he great!” Well, the British comedian would want to play the folk singer. We want to play the failure. Fry is right. It’s difficult to imagine an American wanting to play the Stephen Bishop role. This is a nation of Belushis.